Winter can be hard on horses and horse owners. 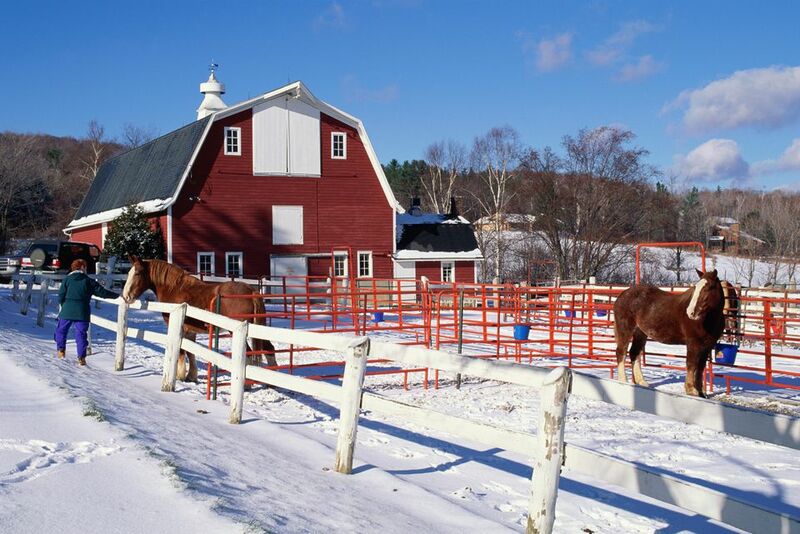 Feeding can be a challenge and the snow and cold can make some horses lose condition. Stable care can become more difficult and riding almost impossible depending on snow depth and temperature. Here are tips for making life easier for you and your horse during the frigid winter months. Even in areas not affected by snow cover, grass often stops growing and the nutritional quality may decrease. As pasture quality or accessibility declines consider increasing hay and concentrates. That way, your horse won’t lose weight during the winter or lack important nutrition. You won’t want to give your horse warm water, but studies have shown that horses offered water that isn’t frigid will encourage them to drink. Impaction colic increases during the winter because horses aren’t drinking enough and there is little moisture in hay compared to grass. They also won’t be able to digest hay and get the most of its nutrition if they aren’t hydrated well, even in the cold. Horses kept outside need to eat more fodder. Horses produce a lot of heat during digestion. A generous supply of hay helps keep the horse’s internal furnace stoked, helping to keep them warm in cold weather. If your feeding program does not include a mineral supplement consider adding one. Test your hay so you know exactly what minerals and concentrates you need to add to your horse’s diet. Make sure your horse’s or pony’s teeth are looked after by an equine dentist . The inability to grind food properly will prevent a horse from getting all of the nutrients and energy it needs--especially if energy needs increase during colder weather. If snow packs into your horse’s hooves try smearing the bottom with petroleum jelly. Talk to your farrier to discuss adding ice calks and snow pads to your horse’s shoes and don’t skip farrier’s visits just because it's winter and you’re not riding as much. Drying a horse out after a workout is difficult. Consider clipping a heavy hair coat. A clipped horse, without natural insulation, will require stabling and blanketing to keep warm. Don’t put a horse out in the cold wet with sweat. Allow extra time for a horse to dry out before turning it out after a ride. Consider blanketing during wet, very windy, or frigid weather. A wet coat loses its loft—like a wet down jacket, and won’t hold body heat. Windy weather pulls warmth away. Some horses are comfortable during very cold weather; some will be more comfortable in a warm winter blanket. Even if your horses are stabled overnight, provide them with a windbreak or a run-in shelter, especially if you are away most of the day. Plan to deworm after the first heavy frost. Bot flies attack in late summer, so in late fall or early winter, use a wormer that includes medication to kill bot larvae. Continue a regular deworming program throughout the winter months. Keep your horse’s hooves clipped. Properly trimmed hooves will chip less, hold less snow, and will provide a bit more grip on the slippery ground. Hard ground and ice can cause serious cracking to overgrown hooves and your horse’ s grip on slippery surfaces won’t be a good if the hooves are too long. If your horse or pony wears a winter blanket (or rug) during the winter remove it daily and check for chaffing and irritation. Daily grooming keeps coats cleaner and your horse more comfortable if he wears a blanket. If it’s rubbing or chaffing, try a different blanket or have the blanket altered. A bib made to go beneath the blanket can help stop rubbing. Rubber buckets are easier to knock the ice out of if they become frozen than plastic ones. Plastic buckets used for water can shatter when they freeze. This can create a hazard and wastes money when replacing them. Rubber buckets may cost more initially, but last longer. What Does it Cost to Care for a Horse, Anyway? Choose the Best Bedding for Your Horse' Stall?